RVP was colossal for Arsenal last season with 30 goals. The 2nd highest goal-scorer for Arsenal was Theo Walcott with 8. The Dutchman is not with club anymore. 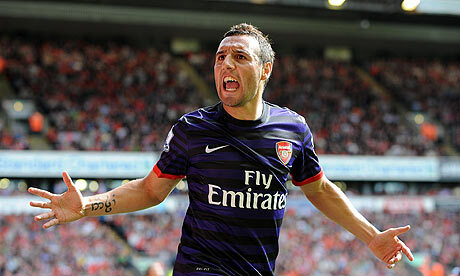 He is replaced by the three-headed monster, Podolski – Giroud – Cazorla. At first sight it might seem like an RVP-less Arsenal would be a lot easier to defend. It might even be true for the first handful of games of the season. However, once Giroud, Podolski and Santi Cazorla are in-sync with each other and with Arsene Wenger’s scheme, they will be a much harder team to defend. As Arsene Wenger pointed out after the 6-1 win over Southampton, when you have someone like RVP who scored 30 goals, the opposition knows who will get the ball. Arsenal have added variety to their attack with Giroud, Podolski and Cazorla upfront. All three can shoot, score, assist and work to create space for the others. While Giroud has not scored yet, his movement has been intelligent and has been unlucky on occasion. Santi Cazorla has slotted in seamlessly at Arsenal (and in the EPL) and much of the same for Lucas Podolski. Cazorla leads EPL in completions in the final third and already has a goal and 2 assists. Podolski has 2 goals and an assist. Based on last year’s numbers Arsenal attack is primarily based on short passing and taking high percentage shots from close range. They are 1st in short passes completed and 1st in shots on target from inside the box. Arsenal also gets majority of their goals from open-play. They are 2nd in touches inside opponents’ 18-yard box. Arsenal also have a high assist to goal ratio. Arsenal are bottom of the table in long balls and are 16th in long pass completions. They also do not cross particularly well. All this put together: Arsenal pass, pass and pass some more until they get inside the area. Once inside the area they try to pass again before taking a high percentage shot (or miss the shooting opportunity). They were average to mediocre at converting corners and set pieces, although that might change with the arrival of Steve Bould as Wenger’s deputy. Steve is known for his preparation and tactical work on the set pieces. We have already seen some of it this season with Cazorla making some signs holding up the ball before taking corners. Both Cazorla and Lucas Podolski are very good free-kick takers and Cazorla has a powerful outside shot. He led La Liga last season with 5 goals from outside the box (including direct free kicks). I have written a piece about Santi Cazorla’s impact on a football team a few weeks ago. He has already had a big impact at Arsenal. Not only does he add bite to the attack upfront, his arrival also allows Arteta to play much deeper in the central midfield, which seems to suit him better. This also allows Arsenal to quickly transition to their defensive shape when not in possession. Cazorla (and Podolski) both track back to defend when they lose the ball. Something that RVP was not very good at. To slow the Arsenal offense, City needs to find a way to minimize the impact of Cazorla and Podolski. Arsenal is a bit weak at fullbacks due to the absence of right back Bacary Sagna. Carl Jenkinson is playing in his place and has looked suspect. They do not attack much on the right, as Jenkinson stays conservative for the most part. Gibbs on the left side has been much more adventurous. If you do a heat map of Arsenal attacks so far this season, I will not be surprised if it is skewed to the left. To slowdown Cazorla will not be easy. During his time at Villarreal, teams like Barça would push their fullbacks up and force Cazorla to defend the full back, thus pushing him deep and further away from the high-value areas. After their early season funk and the 8-2 loss at the Old Trafford Arsenal have defended really well last season. They allowed the lowest # of touches in the final 3rd and the 3rd lowest # of shots in the league. Arsenal are also 1st in last man tackles with 25 (12 more than the 2nd best). This implies that they most likely defended with a high backline and tried to recover possession as quickly as possible. Since they keep the ball a lot, it reduces the touches for the opposition in Arsenal’s defensive third. The last man tackles were by center-backs to cut out the through balls. (Koscielny – 9, Vermaelen – 5 & Mertesacker – 3). With such a defensive scheme, it is not surprising that Arsenal forced the highest # of offsides and have let in 4th highest # of through balls. Arsenal defence also has the lowest # of blocks and 2nd lowest # of clearances. They defending far away from their area, so there is a less need for clearances. This season, so far has been a slightly different story. Arsenal are defending deeper (opinion based on watching games) and more compactly (2 lines of 4 very close to each other). There is more emphasis on defending set pieces and corners. This could all be due to Steve Bould but could also be due to the absence of Bacary Sagna or probably a bit of both. They have conceded just once so far (on what seemed like gaffe by Szczesny). By defending deeper Arsenal might concede a lot more corners, crosses and throw-ins close to the area but it also reduces their giving up breakaway attacks and through ball opportunities. Szczesny is one of the best young goalkeepers in the league prone to the occasional error (like last week vs. Southampton). He is one of the best short passer and 2nd best distribution. He also has one of the most balanced long passes to short passes ratio at 51:49. This stat underlines further the Arsenal philosophy of short passes. He did concede a lot of goals (49) but a lot of it is down to Arsenal’s defensive scheme. They used a high backline, which means when the opposition forwards beat the high line, they were more likely to have a favourable match-up in terms of numbers and a clear sight of the goal. Szczesny’s league lowest # of total saves could very likely be a side effect of the overall defensive scheme. City missed Yaya Toure in the game at Emirates and failed to register a shot on target for the only time all season. Even at the game in Etihad City only managed 105 successful passes. Last season Arsenal gave Manchester City two of its toughest games of the season. They did not allow City to enjoy the possession dominance in the final 3rd they are used vs. rest of the teams in the EPL. The games were very close. Small details and moments of individual brilliance (or an error) determined the results. to limit the influence of Cazorla and Podolski. Take advantage of one of the few weaknesses of Arsenal, the fullbacks – especially on the right side. Minimize Arsenal’s touches in the final 3rd – Arsenal will enjoy a lot of possession due to the nature of their game. However, limiting their possession in the high-value areas will be key to City’s success. David Silva, Yaya Toure, Balotelli and Tevez need to have great games for City. The injury to Samir Nasri at the Bernabeu could be a big blow if it forces him to miss out the Sunday’s clash.